So thrilled to have as a guest blogger, the creative and talented, Jennifer Kampfe of Fantastically Focused! Jennifer is prepping us for summer – that magical, exciting time when schedules and structure disappear leaving many of us struggling with what to do! Well, if you’re the parent of a child/tween or teen with ADHD, that feeling in your gut probably isn’t excitement. We know all too well that summer days can be a recipe for disaster. What if I told you there was a way to ward off this looming disaster? A way to keep yourself and your child from drowning in the stormy waters of an unstructured summer. A life vest, so you float rather than sink. Sounds pretty good, right? 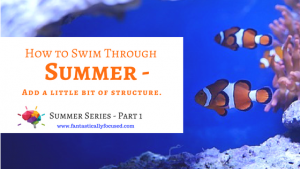 In our hectic lives, it may seem impossible to provide structure during the summer months. Especially if you work full time and have older children. After all, it’s summer for crying out loud! Right? Plus, if you can swim why would you wear a bulky life vest? If you don’t have ADHD, you’re more than likely capable of swimming through each day. Focus on what needs to get done. Put off any distractions. The Dad in “Finding Nemo” comes to mind. Marlin was focused on one thing and one thing only – keeping Nemo safe. And nothing could distract him. On the other hand, your child, tween or teen with ADHD, is more like Dory. Sure, she swims through her day…sporadically. She is constantly distracted by more interesting things. She forgets what she is supposed to be doing and must be constantly reminded. Just thinking about her exhausts me. Your child will be just like Dory this summer, and you will be exhausted – unless you provide him/her with the life vest of routine and structure. Due to lagging executive functioning skills, (like Dory’s deficit in working memory) those with ADHD struggle without structure. It can feel like sailing through a storm with a broken mast and no life vest. Or darting around the ocean every which way like Dory. Either way, it’s exhausting and frustrating for all involved. The easiest way to start a summer routine is to build off your school routine. Designate a set time for lunch. If your child takes medication, this often decreases their appetite and without a specific time to eat each day, he/she may skip lunch altogether. Add any already scheduled activities, like baseball practice, and go from there. Remember to get your child/tween/teen involved in the process. We should aim for a “Nemo-like” summer – a little bit of Marlin’s focus, a little bit of Nemo’s bravery and curiosity, and some of Dory’s fun lovin’ spirit. Providing your kiddos the life vest of a routine can help. 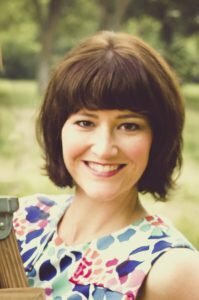 Jennifer Kampfe, is a certified ADHD coach from Lincoln, NE, and holds a Master’s degree in Music Therapy. Jennifer is passionate about helping those impacted by ADHD and works with children, teens, college students, adults and parents impacted by ADHD in person, or by phone/ video. When her second son was diagnosed with ADHD in the 2nd grade, Jennifer embarked on a journey to educate herself and others about ADHD and to empower her son with the confidence and skills to be successful. Along with her ADHD Coach training, Jennifer brings a compassionate, understanding heart, and experience parenting two children with ADHD to her coaching practice, Fantastically Focused. « Finish The School Year Strong!